Ballpark Basics: The archetype that changed the face of modern ballparks. In the early 90’s, Camden Yards replaced Memorial Stadium, where the Orioles had played since Major League Baseball returned to Baltimore in 1954. Recently, a tribute to those earlier years of Baltimore baseball history was added at the far end of Eutaw Street with words “Time will not Dim the glory of their deeds” taken from the old façade (still one of the best fonts we’ve ever seen). And what can you say about a place whose creation inspired ballpark design for the next twenty years? With (at least) three books written on its construction alone, Oriole Park at Camden Yards changed the way that ballparks are still being built today. 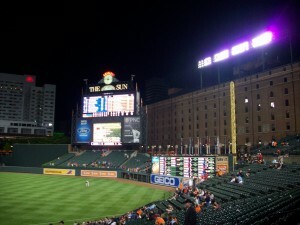 Most significantly, Camden Yards brought the focus back to hometown baseball, moving away from the dual use stadium in the suburbs and brought the game back downtown. The most recognizable part of Camden Yards has to be the B&O Warehouse. Ironically, the initial plan was to tear it down during the construction of the stadium in an effort to make it easier for fans to access the Inner Harbor just a few blocks west. Thankfully they didn’t, and today the warehouse is not just a symbol of the park, but it also serves many purposes for the team. The team offices are housed in the warehouse along with the food services. On the first floor there is a team store and a bar that surprisingly popular during games – I always find it ironic when people pay to attend a game and then watch it on TV’s in a bar in the stadium! There is also event space that can be rented out for meetings and presentations as well as weddings. (History nerd fact #16: During his presidency, Lincoln stopped at the B&O station more than once, and his funeral train also stopped there on its way to Springfield). Eutaw Street, buffered by the warehouse on one side and the ballpark on the other, has a festival setting before and after ballgames. The smoke from Boog’s Barbeque hovers along Eutaw inviting people to one of the most popular spots to get a pre-game meal, and all along the way, there are little bronze baseballs to signify where the furthest home run balls have landed. When constructing the park, the windows on the first three floors of the warehouse were plated with shatter proof glass with the expectation that home run balls would be bouncing off the warehouse. However, in all the games played since the park’s first season in 1992, only one ball has ever hit that far; a Ken Griffey Jr. blast during the Home Run Derby in 1993. The Eutaw Street gate also serves as the main entrance to the park. Weaving through retired numbers of Orioles greats such as Earl Weaver, Jim Palmer, Brooks and Frank Robinson, Cal Ripken, Eddie Murray, and Jackie Robinson, you will find a statue of another young hometown hero, Babe Ruth. There is actually some debate as to whether there is a mistake with the glove on the statue. While it is a right hander’s glove, not the left hander’s one worn by Ruth, the sculptor claims that it was rendered from a picture of Ruth so even though it is not his glove, the statue is accurate. While the stadium was revolutionary when it was built, today, 20+ years later, there are aspects that date it. For example, it was built before the advent of open concourses in parks, so you can not watch the game as you wander the concourse. Despite these minor issues the park does not feel dated, and represents a historic shift in ballpark design. Recent efforts to keep Camden current have also been successful, as it has recently undergone renovations to several areas of the park. This includes upgrading to a new scoreboard and replacing much of the seating, (they sent the old seats to their new spring training home in Sarasota). The new seats are wider which led the capacity to drop to 45,971 from 48,290. The Miller Lite Flite Deck is another new addition to the park. Located on the club level down the right field side, while drinks are not included with these tickets, it does provide a place where you can take in the game from a bar stool with drink rails. Baltimore led the league in attendance for years after Camden Yards opened. 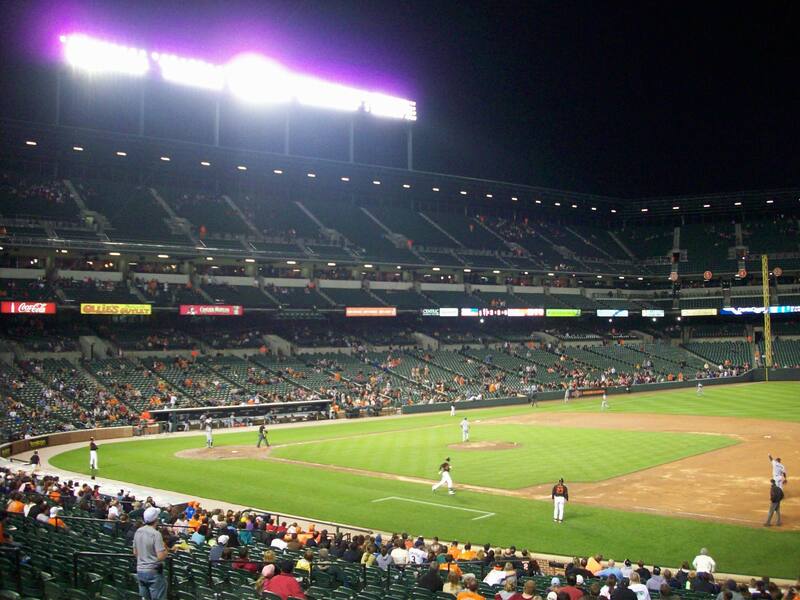 More recently, with a perpetual losing record and a beleaguered team owner raising the ire of the fans, attendance has dropped sharply, in fact their attendance in 2010 was the lowest ever at Camden Yards and the lowest for the team since 1988. Even with the low attendance, the park is a fan favorite. It was ranked 5th overall on a recent study that used Yelp to rank the best ballparks, and the lower attendance make it quite easy to get good seats, many times on secondary markets, for less than face value. On our most recent trip we were able to score tickets four rows from the field for $20 below face. Another notable improvement occurred very recently, as 2011 marked the return of a Baltimore beer institution to the ballpark. National Bohemian (Natty Boh) was finally available on draft at Camden Yards for the first time since 1992. It was once the official beer of the Baltimore Orioles, and the chairman of the brewery was once a majority owner of the O’s. Natty Boh is to Baltimore what Old Style is to Chicago. Baseball Nerd Fact #3: When attending a game there are two other sports related things to see. Right next to the Eutaw Street entrance, housed in the old ticket office is the Sports Legends Museum. There are exhibits dealing with the Orioles history as well as the Baltimore Colts and Ravens. There are also exhibits for other sports throughout Maryland (college, minor league, etc). Another great museum to visit is the Babe Ruth Birthplace and Museum. Located just blocks from Camden Yards, you can actually follow the 70 baseballs painted on the sidewalks outside Camden to find this museum. Brew Basics: Great beers, great location, and lots of space makes this one of the best places to go if you’re taking in an O’s game, or just looking for a spot to hang out in Baltimore. 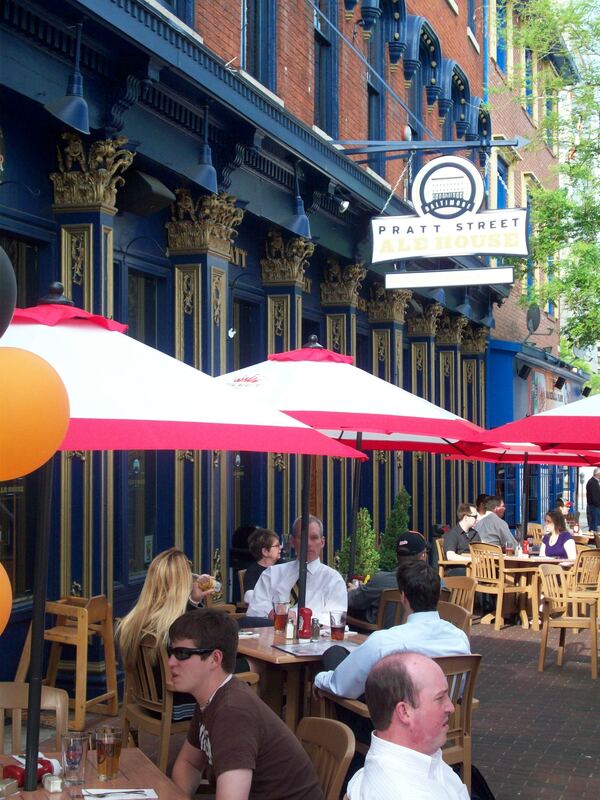 Pratt Street is located in a handsome brick building in heart of downtown Baltimore in walking distance to pretty much everything. Originally built in 1888, the (originally three different) buildings have seen the city transition from small port town to bustling city. The building itself has transitioned from furniture company, through several restaurant incarnations, and finally to brewpub in 1993. It quickly became a standard B’more “go-to”, and maintains the distinction of being the oldest active brewpub in the Baltimore area. 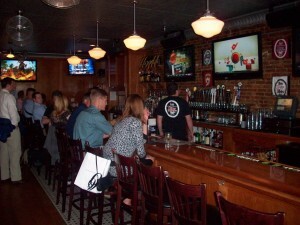 On our first visit, we were able to squeeze into a corner of one of the downstairs bars and were enveloped by a mix of Washington Capitals, Baltimore Orioles, NY Yankees and the band “Rush” fans who were all in town for one event of another. Even with this mix of fans and personalities, no one was disappointed as the 25 HDTV’s were tuned to everything from ESPN’s SportsCenter, NHL playoff pregame highlights, different innings of various ballgames and even a Rush retrospective. Despite the packed house, beers were readily available, because while this place is packed before pretty much any and all Baltimore events, but they are ready for it. 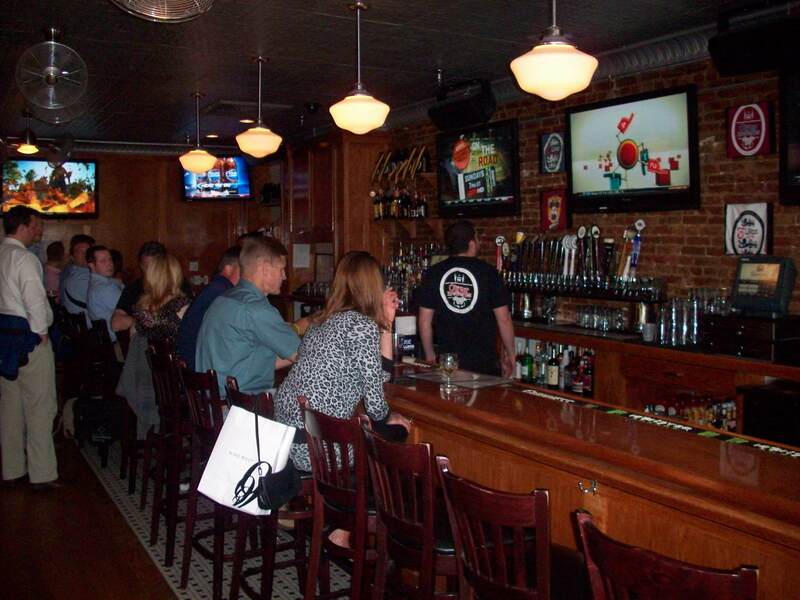 There are two bars downstairs, and ample bar tops and regular dining, plus an entire second level complete with third bar, two rooms to accommodate private parties, and more seated dining. Outside they convert their deck into a party patio, complete with an additional bar, pitchers, and game day specials. The staff was friendly and attentive, and not at all annoyed even though the game ended up being a rainout, and we squatted at a larger than necessary table, for well over an hour waiting for the other half of our party to arrive. Owned by the Oliver brewing, Pratt Street Ale House typically has 17 different beers on tap, and on the day we visited, had three more cask ales. With this many beers to choose from, one might expect that each is just a slight variation of the last, with minor tweaks to pad the beer options. Not the case, lots of creativity went into the design of these recipes, with the result that each beer is different and unique; not just from the others on their menu, but from other beers available elsewhere. We visited twice (I mean the game was rained out, who were we to not give Camden Yards a second chance?) and valiantly attempted to try as many of the Pratt Street styles as we could. We hope you are impressed with our efforts – and the calories we consumed to create an accurate report for you. Bishop’s Breakfast (4.4 ABV) – An oatmeal stout that literally smells like cookies (oatmeal, sugar, nutmeg…) that was smooth and had faint smokiness in the aroma and palate. This is one of their nitrogenated beers, which they claim provides the smoothest pour possible and “a silky finish”. Old Habit (5.7 ABV) – This beer is brewed in the English brown style, and was very good. It has a good coffee color, is not at all sweet like a nut brown would be, and although the aroma is that of raw materials, the taste is not at all earthy. There is a lot upfront with this one, it’s go a strong coffee taste and is more carbonated than one comes to expect with a brown, but all the flavors combine just right with the malts, making the Old Habit something that could easily become one of our new habits. 18 (6.4 ABV) – created to celebrate Pratt Street’s 18th anniversary, Jim was reminded of another anniversary – ours – and asked for his ring back as this was his new love. It smells spicy, tastes smoky, and is so dark, it is almost opaque. Although similar in style to the Bishop’s Breakfast, it pours with less head and is much more thick and smooth. Irish Red (6.0 ABV) – This had an unusual color, an orangey-brown similar to thick apricot jam. We were warned upon ordering that this is nothing like a traditional red ale, and the warning was right on. The Irish Red Ale has basically no head, and smells surprisingly fruity, but not in a bad way. The overall taste was just a little bitter with a sweet, hoppy finish. For those familiar with Magic Hat, this is reminiscent of a Number 9 with the apricot undertones, but finishes a bit more sweetly. Pagan Porter (4.9 ABV) – This arrived with a big head that didn’t dissipate. It was very carbonated, and just slightly – very slightly – lighter in color and thickness to the 18. However, as the 18 was high on Jim’s list of favorites from this place, this one was very low. Perhaps we were unfairly comparing it to others we had been impressed with, but when judged against other Oliver Ales of similar style this one came up lacking – with less aroma, a bitter initial taste, and then no real characteristics other than being thick and strong. 3 Lions Ale (7.5 ABV) – Aside from a higher ABV, when you drink this one, there is just not a lot there…at first. The taste builds slowly, and ends with a push of flavor at the end. It is a warmer brown, and a another brewed in the English brown style. Unlike the Old Habit, 3 Lions is slightly bready, strong and tart – and one of Oliver’s signature ales. It comes with moderate carbonation, little head and no lacing. Overall much more of a sipping beer. Coventry Cream (6.0 ABV) – This one smells just like it tastes, creamy, bitter and strong. An almost coppery reddish brown color, it’s a hearty beer with strong malts. This is definitely not for those without a strong palate, for although the taste changes throughout the sip, the one thing you can count on is that it’s fully flavored. Oliver ESB (6.0 ABV) – as advertised, this extra special bitter has a ton of hops, but it isn’t at all hard to drink since the mouth feel is surprisingly smooth and the flavors culminate with a lingering aftertaste. Pratt Street will even tell you that this Oliver brew was ranked by “Beer Hunter” M. Jackson as a “world class beer” and was included in at least two of his books listing must try beers. Summer Light (4.3 ABV) – typically when we think summer beers, we think “fruity, wheat beer”. This is neither, and instead just a simple, carbonated, crisp beer that finishes cleanly, and is actually available year ‘round . Blonde Ale (4.3 ABV) – One of their most pale, easiest to drink beers that is lighter than most other selections in both color and taste. Slightly hoppy, and not at all unflavored, this one is goes down quickly and is a good one if you’re “in a rush” or if you’re not sure what you’re ordering to eat. Dark Horse Ale (4.0 ABV) – another milder selection that is easily as drinkable as the blonde, but is deeper hued. As with the one listed above, this is kind of the same “go to” beer if you want to start easy, or get a few down quickly but like a bit of a darker beer flavor. Cherry Blossom Ale (5.4 ABV) – one of the big tragedies of our first Baltimore trip (besides the whole rainout thing) is that they were also sold out of this seasonal. Apparently this one flies off the shelf, and according to our first bartender “once it’s gone, it’s gone”. Happily, since our first visit was early in the Cherry Blossom season, they saw fit to brew more and this is the first one Gillian ordered on our second visit in early May. Served in a snifter, they call it a red ale, and they’re not kidding – this is a wheat beer that has so many cherries mixed in, the color comes out more like cranberry juice than anything beerlike. Happily, while the cherry essence is pronounced, it does not overpower the hops and malts but blends for a flavor that is just sweet enough, but not nearly as sweet as you’d expect.